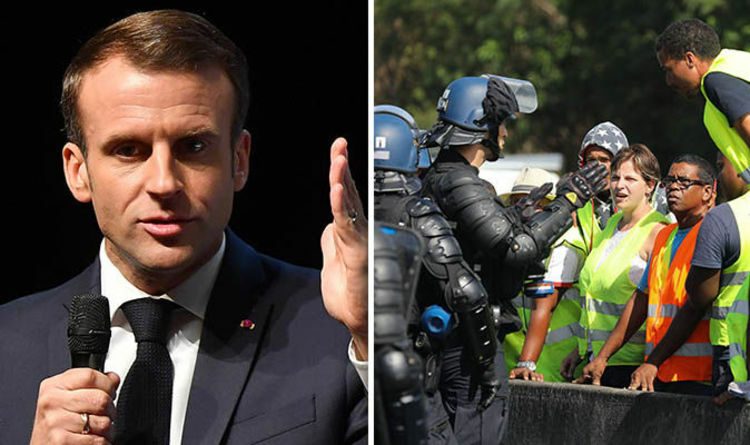 Mr Macron promised France will be “inflexible” against those violently opposing to the government on the island, adding "you can not accept the scenes" that have been seen in recent days. The French President made the announcement on Twitter, writing: "The situation, which has been developing in Reunion since Saturday, is serious. “We have taken efforts and will continue to do so — our servicemen will be mobilised starting from Thursday to restore public order. The President also said that the problems affecting this island "come from afar”. He assured that his Government "has begun to treat them one by one", promising an improvement of the situation "in depth". The Overseas Minister, Annick Girardin, said the violent acts in La Reunion are the results of actions by "radical groups" that have nothing to do with the "yellow vests". Chaos sparked across France on Saturday, when more than 287,000 people attended marches and protests wearing yellow vests to oppose to the announced rise in taxes on fuel to be implemented next year. Echoes of the outcry reached La Reunion, a French overseas department in the Indian Ocean, where police and protestors have been clashing today. At least 16 police officers were injured, according to the French government, and more than 100 arrests have been made. French government spokesman Benjamin Griveaux said: "The latest data on Reunion was shared with us by the cabinet. The price of fuel has grown steadily over the past ten months, with consumers bearing a 23 percent increase for diesel and a 15 percent rise for petrol. According to government’s plan, prices for both petrol and diesel will further grow by respectively 2.9 eurocents and 6.5 eurocents on January 1 next year. Mr Macron defended the proposed rise, arguing it will help reduce pollution. And he also pointed out that the main rise in prices suffered by consumers is not due to taxes, but comes as a consequence of rising oil prices. He added he will meet with oil companies and distributors to tackle the problem.